BRYANT & MAY - THE BURNING MAN is the twelfth book about Arthur Bryant, John May and their Peculiar Crimes Unit. THE BURNING MAN begins on the eve of Halloween with the City of London heavy with the noise of riots - "Hurled fire, catapulted bricks, shattering glass and the blast of water hoses. It was as if, after a drowsy, sluggish summer, the streets had undergone spontaneous combustion" - to quote from the first chapter. The spark which ignited these events is the result of the actions of one banker who brought his old city bank to the brink of collapse through insider trading that had gone wrong and is now being rewarded with a payoff of several millions. The revealing of that payoff sparked hyperbole in the press, questions in the House and riots on the streets. Against this background of chaos a young homeless man burns to death, seemingly caught in the crossfire between rioters and the police. The investigations of the Peculiar Crimes Unit find that a killer is using the opportunity of the chaos to exact revenge - but against who and why? Bryant and May use their network of eccentric contacts and their usual highly unusual investigation techniques against a background of mob rule and history leading to multiple confrontations on Guy Fawkes Night. The (now almost traditional) memo from the Peculiar Crimes Unit chief is here so that a new reader see what has gone before so they are not confused and a regular reader can start the book with a good laugh with the characters they know so well. The dark humour that one expects of a Bryant & May novel is there with a tinge of both reality and perhaps more of pathos than usual. The plotting is tight with lots of twists, turns and misdirections to keep the reader engaged and on the edge of their seats. 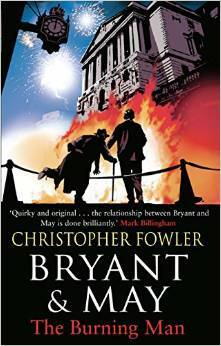 Overall this is yet another strong Bryant & May novel in a series which seem to get better with each new volume.